It is possible to rediscover flavours, scents, and colours of the ancient gastronomic tradition of Marche comfortably sitting at the table, thanks to work, commitment, and passion of a family run company located in Macerata, in the hearth of Italy: farm Si.Gi. which since 1969 has combined originality and innovation with respect for tradition of the ancient local gastronomic recipes. More than 15 years ago, Mr Silvano Buccolini and Mrs Giuliana Papa Buccolini started a reality which today is considered as an excellence of Made in Italy, thanks to research and recovery of varieties of ancient fruits that had been forgotten, organic cultivations which guarantee both pureness of raw materials and simple, natural, and artisan working methods, which respect the cycles of seasons. Jujube is certainly the ‘recovered’ ancient fruit which mainly allowed both success and achievement of this enterprising farm. 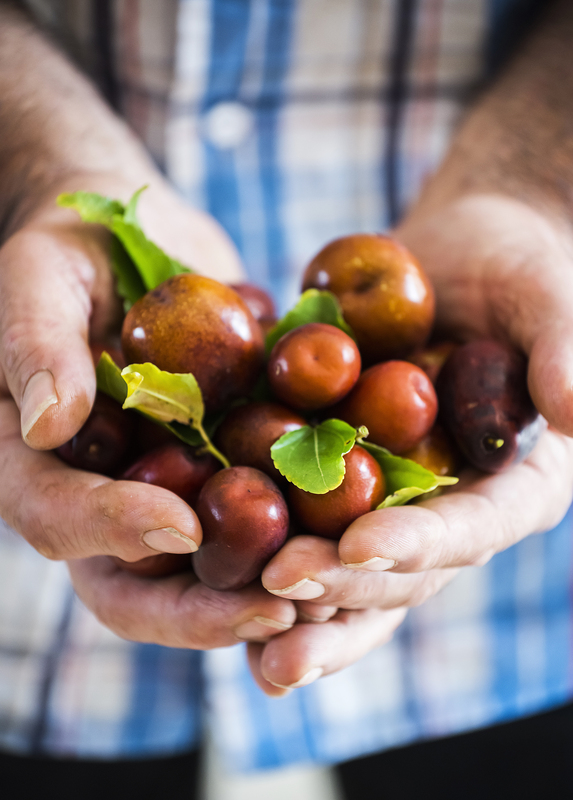 From a deep research concerning this fruit, widespread in Central Italy as well as in all the region Marche, and its working and transformation, Si.Gi. has been able to create a very peculiar wine, really new in the oenological domain, characterized by an intense gold colour, whose transparency impresses. This wine, whose name is ‘Giuggiolone’, is obtained by maceration of jujubes with ‘Trebbiano’ wine, with a method which lasts almost three years and allows extracting the oily juice of the fruit. It offers all the scent of ripe jujube, its flavour is clear, balanced, and reminds date, fig, and honey; its structure is characterized by an acidity which makes it peculiar, suitable for accompanying ripe and marbled cheeses. 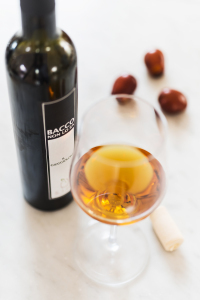 ‘Giuggiolone’, an integral part of the company line ‘Baccononlosa’ dessert wines, alongside with ‘Viccotto’ and ‘Vino e Visciole’, today is produced in 5,500 bottles a year by this company only, which results to be the only one that masters its difficult production process and commercializes this product. It is required by wine shops, specialized shop, and high class restaurants, mainly in Italy, but abroad, too: it is commercialized in Sweden and Poland, but is very successful in other Countries, too, among which Brazil and Japan. Silvano Buccolini and Giuliana Papa with their daughter Martina Buccolini. Silvano Buccolini, owner and commercial director, tells: «In recent years we received many important prizes and acknowledgements and obtained ISO 9001 certification. All our fruit is organic. Some products are certified AIC (Associazione Italiana Celiachia – Italian Celiac Disease Association), while since 2012 we have self-certified some of them as gluten free. In addition, we are part and have been promoters of the Consortium for safeguard and recovery of the Pear ‘Pera Angelica di Serrungarina’, with which we prepare a jam, a sour-sweet product, and fruit in syrup. We have a project for the future: alongside with Region Marche and University of Camerino, we are providing financial support for an important research which aims at characterizing the potentially functional ingredients of ‘visciola’ that could be beneficial for man’s health. For such a small company as our one, this is an ambitious project, which could originate a new start-up for producing nutraceutical supplements from our local alimentary products and fruits». Besides Giuggiolone, Si.Gi. successfully produces and sells more than 40 different types of jams, jellies, sauces, ‘sapa’ (a seasoning typical of Marche but also Emilia Romagna and Sardinia: a grape syrup obtained from the must of red or white grape), products in oil, and fruit in syrup, not only in Italy, but in Sweden, Norway, England, Poland, Czech Republic, Canada, USA, and Australia, too. From every product obtained in a particular season, about 4,000 jars a year of different sizes are produced. All these delicacies are strongly linked to the land of Marche, because they are either produced with typical fruits of this land or ancient recipes, passed on from generation to generation. A typical example is the white fig jam, produced with an ancient variety of fig and excellent in combination with white meats and delicate marbled cheeses, or apple and mint jam, soft, creamy, and typically summery, ideal with white sea fish, or quince and sapa Jam, whose dense and soft consistency makes it perfect for accompanying boiled capon and polenta-based snacks. Bacchus did not know that it is possible to prepare very good dessert wines by means of some types of fruit! The line of dessert wines Si.Gi. aims at communicating this concept, besides an idea of research, experimentation, and discovery. The image of Giuggiolone is clean and elegant, thanks to a label in valuable paper characterized by essential lines and colours, modern and innovatory, suitable for a niche market to which the company directs its attention. Its packaging, as it happens for the other dessert wines, is carried out industrially, by means of a bottling-machine and a labelling machine. Buccolini explains: «We invested on packaging and design from both concept and type of valuable paper. For us, this stage is essential, because, by means of our packaging, we want to show to our customers the same care and scrupulousness we use in the production processes of our wine». In its ‘Odyssey’, Homer tells that Ulysses and his men, who had been misdirected by a storm, landed in Lotus-eaters’ island, in Northern Africa. Some men, after landing in order to explore that island, let themselves be tempted by fruit of lotus, a magic fruit which obliged them to forget wives, families, and homesickness. It is probable that the fruit about which Homer talked is Zizyphus Lotus, a wild jujube, and the spell under which Lotus-eaters fell was not caused by narcotics, but only by the alcoholic drink which can be prepared with the fruits of jujube. It seems that for ancient Romans jujube was a symbol of silence and it decorated the temples of Prudence. In addition, in Central Italy in many farmhouses it was grown as a lucky plant which was placed in the most protected part of the house, exposed to the sun. The Italian saying ‘Andare in brodo di giuggiole (‘To go into raptures’) reminds the content in sugar of this plant and is used for indicate a person who feels the sweetness of a strong pleasure.